The Wyoming Bill of Sale Forms considered legal documents that record the legal sale and purchase of various items. These forms will provide information regarding the change of ownership, identification information pertaining to the sale item as well, information with regard to the buyer and seller. Some documents may require notarization. Automobile Bill of Sale – This document would be used to provide proof that a motor vehicle has been legally sold and purchased. This form may be required as part of the registration process. Firearm Bill of Sale – This document will prove the legal sale and purchase and act as a receipt for the transfer of a gun. General Bill of Sale – Use this form if you are private parties selling and buying personal property. 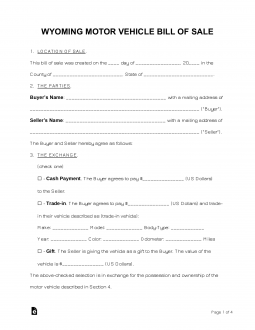 Vessel Bill of Sale – This form would be used to prove the legal sale and purchase of a boat. You will be required to produce a Current registration from your previous state (if any). You must send a completed Wyoming Watercraft Application. You must also send a copy of your notarized bill of sale. You must send fee payments with your documentation by check or money order. You may locate a fee reference on the application.